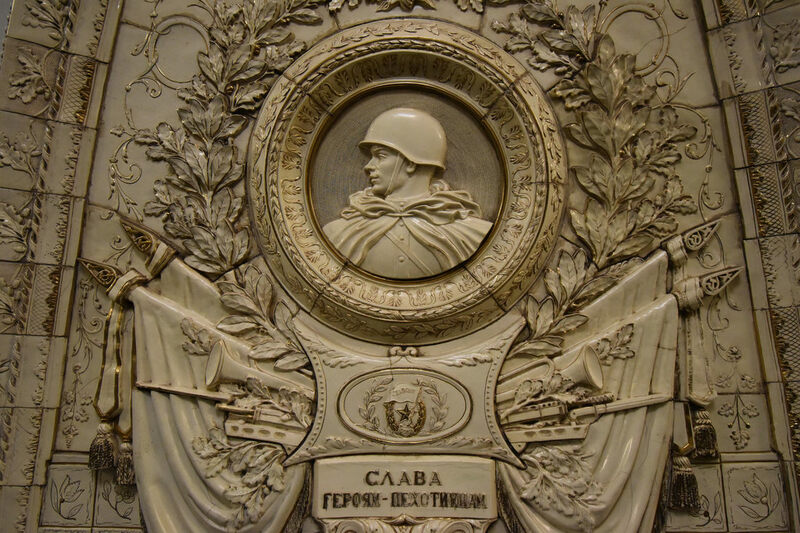 When I hear Soviet Architecture I think of block buildings and Soviet Realism statues. The block buildings are cool in a unique and boring sort of way. They are cool because there's nothing that plain that also sticks out without any character, which is hard to pull off. Stack a lot of them together and the views get a bit boring. 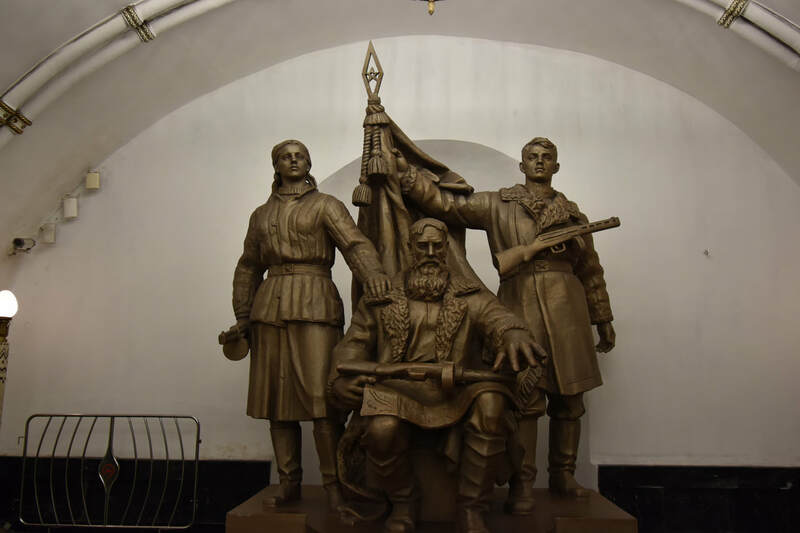 I find the Soviet era statues impressive because they do such a great job of capturing the good and the bad of living under a single party communist rule - bold but no individualism or variation. 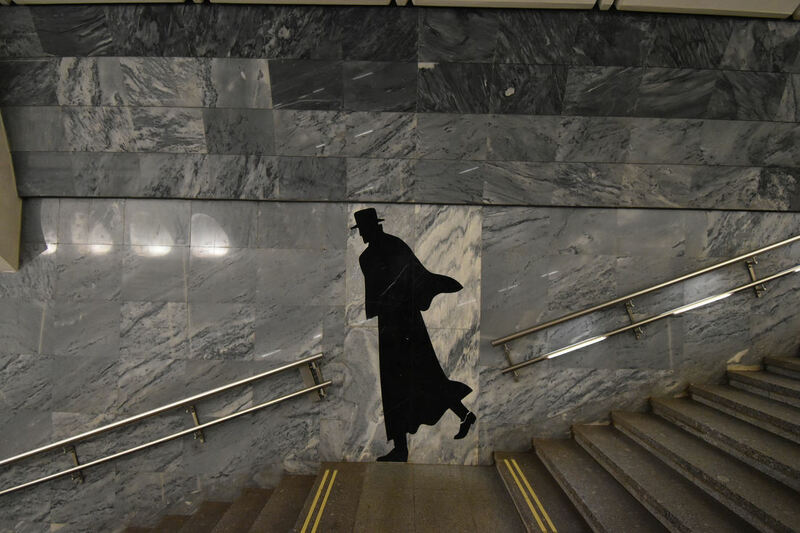 And then you arrive in Moscow and see the city's metro stations and you don't know quite how to react. The stations are stunningly beautiful. Each one is distinct. 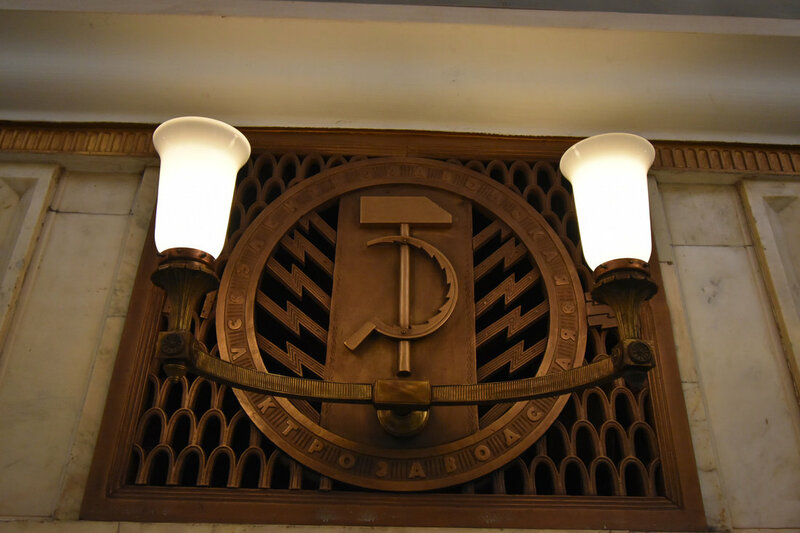 Each one has it's own flair that reflects the ideals of the Soviet Union but with some leeway that building architects and statue artists seemingly weren't allowed. 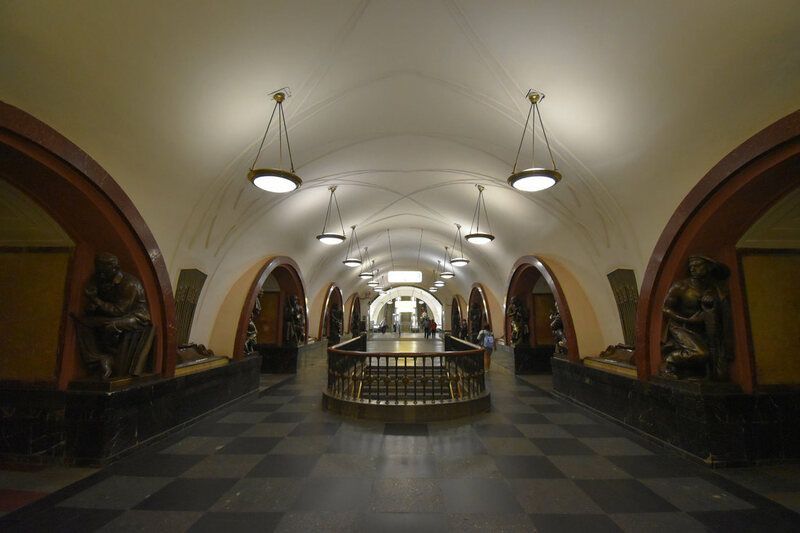 It seems strange to say this - the best Soviet Union architecture and artwork is underground. For a country that loves to project strength (and then have very little behind the projection) it's an odd juxtaposition that something to complement the strength isn't in plane sight. Beyond the aesthetic qualities the metro system serves as a bomb shelter so there's long escalator rides down to the platform (this only further solidifies my views that Washington DC's metro system is also a bomb shelter). For photo taking purposes I rode the metro on a Sunday morning. I thought no one would be on the metro...but...Moscow bars close at six am so there's plenty of drunks stumbling home. 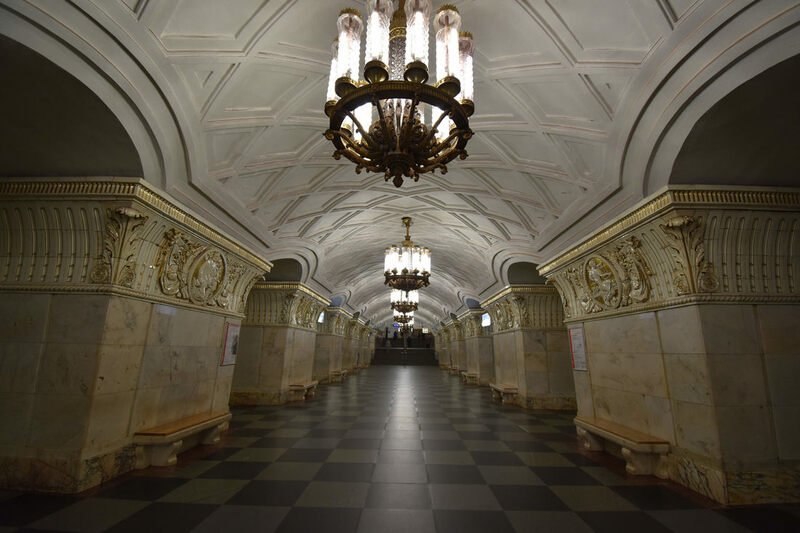 The phrase "skaya" appears at the end of numerous metro station names - Skaya = Square. 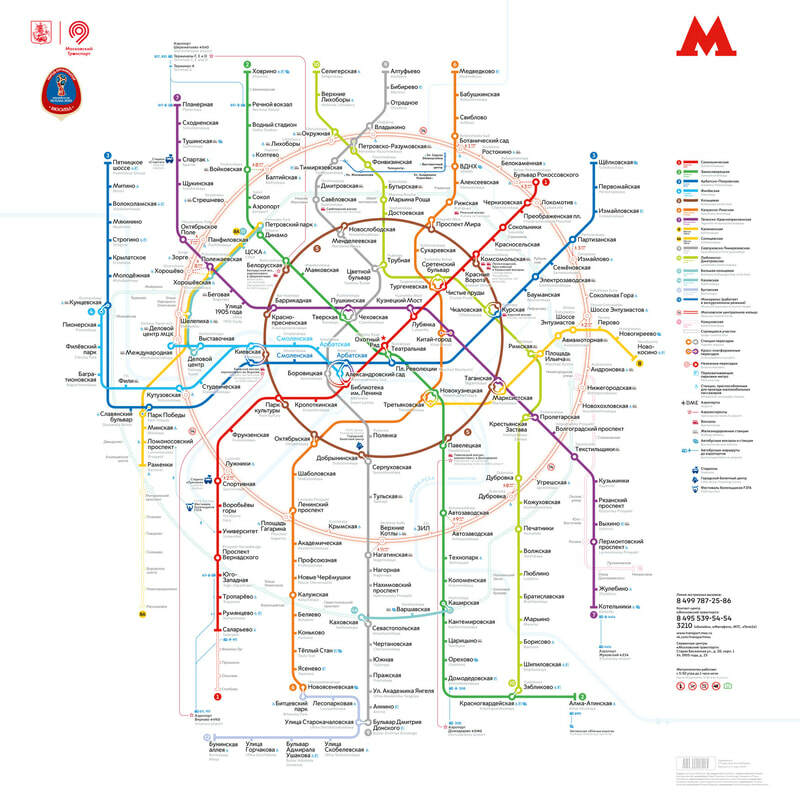 The metro map is well laid out. The metro system passes 224 stops and stretches for 226.7 miles - roughly the same distance of track as New York City's metro system. For all the stops and distances, the map is relatively easy to digest. The only confusing part is it can be difficult to figure out from which track to board. Routes are listed on the walls behind the tracks so if a train is pulling up, you need to use your sense of direction to know if that's the correct train to board. Out of twenty rides, I boarded the wrong train twice. From the exterior the metro cars appear a bit dated, however, on the inside the carriages have all been updated thus there's a nice nostalgic feel when the cars arrive and nice interior once the doors close. Stops are announced in English. A single ride costs 55 RUB or roughly $1. 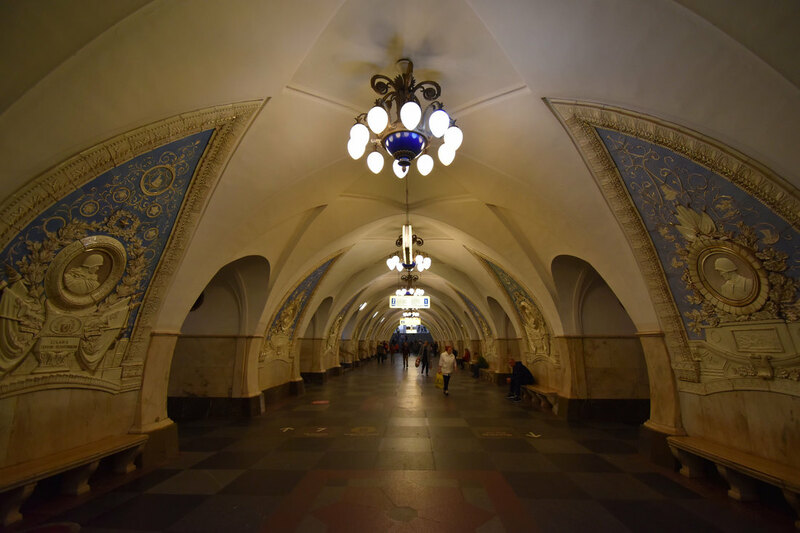 For 55RUB a self-guided tour of Moscow's metro system represents one of the best value attractions any where in the world. I read several blogs to cross reference stations and plan a route to hit up the better stations. 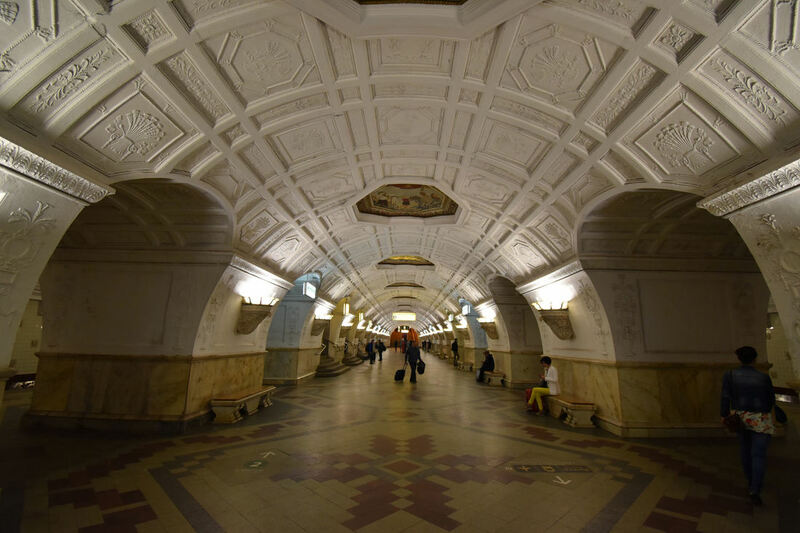 My hostel was above the entrance to the Tverskaya so I started there and took Trak 2 / Green Line to Mayakovskaya. 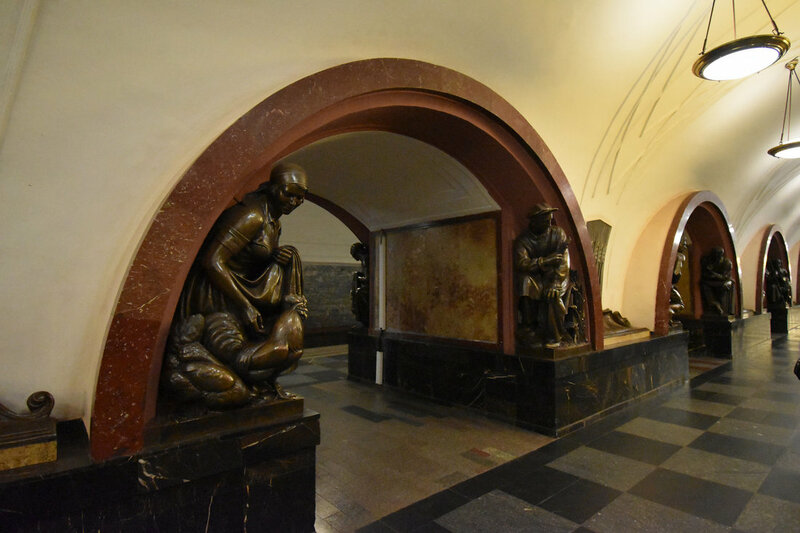 ​Mayakovskaya was a good station to start with because it doesn't have the reliefs and detail of other metro stations. It has a simple and elegant design. 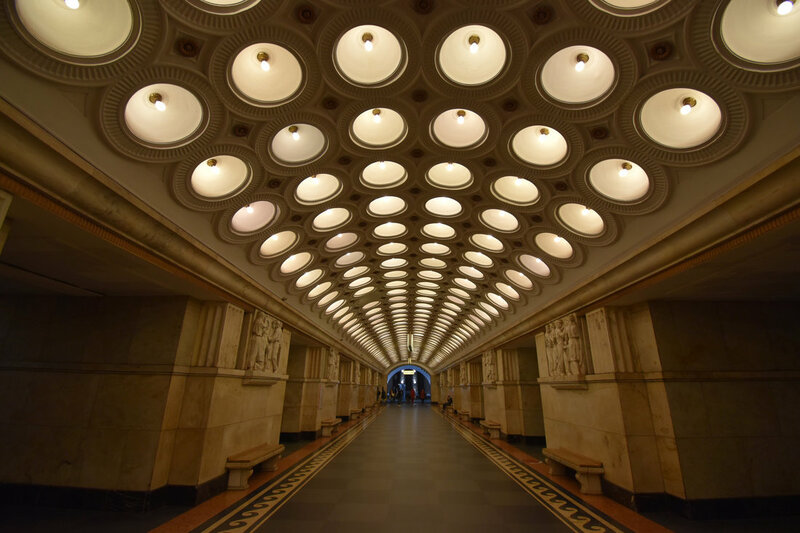 The next stop on Track 2 is Belorusskaya which also connects with the 5 Line, which is a circle that connects Moscow's other lines and also stops at several major train stations. At the far end of the station is a military themed statue. 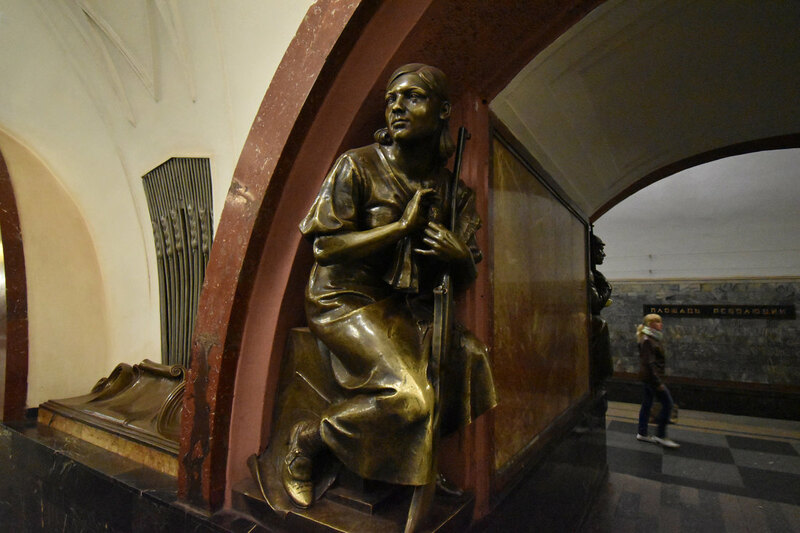 Statues honoring soldiers and other Soviet heroes and themes is a recurring image in the metro stations. 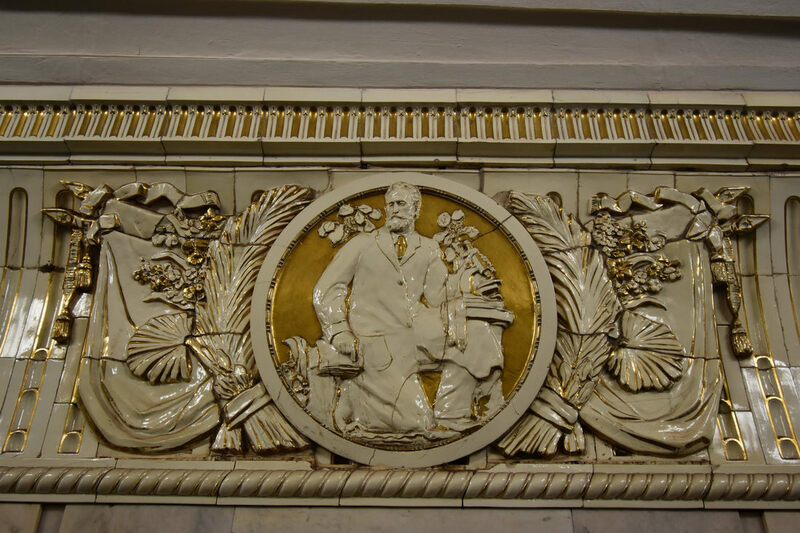 You won't find anything similar to this on Philadelphia's Broad Street Line. 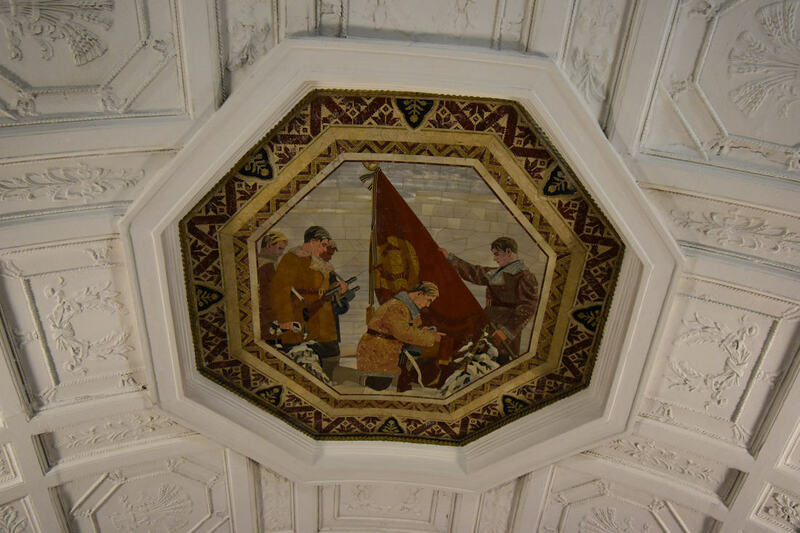 This station was also the first one I visited that had detail within detail. 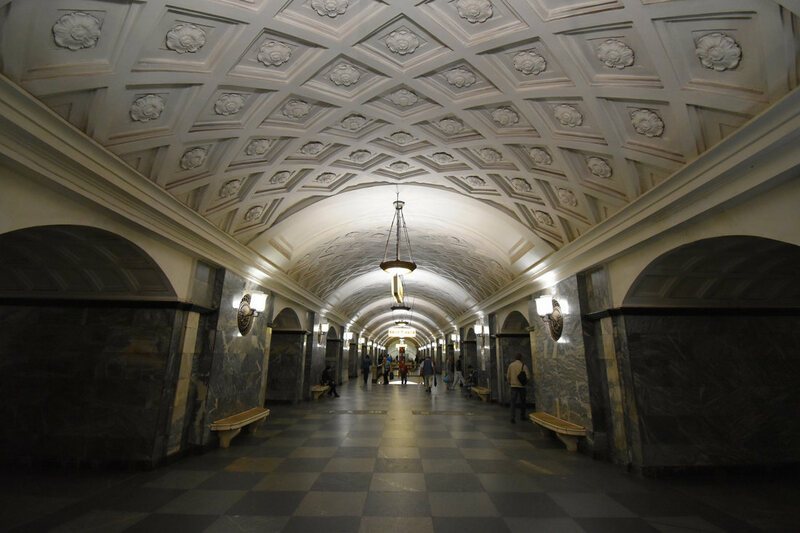 The ceiling's molding would be impressive enough without Soviet life paintings but hey the more freedom of expression in the Soviet subways the better. The next stop east on the Circle Line is Novoslobodskaya. At each of these stations I hopped off the train, took a few photos and hopped on the next train. Trains run every two minutes, at every station, even at 6:30am on a Sunday. They have New York City beat...by a lot. 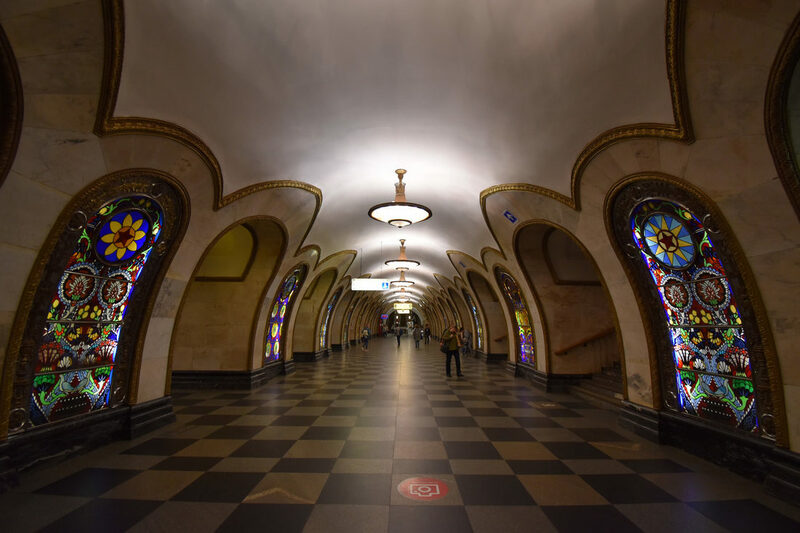 Novoslobodskaya felt like a church with stained glass windows occupy the walkways between the central area and the platforms. The next stop on the Circle Line is Prospekt Mira. 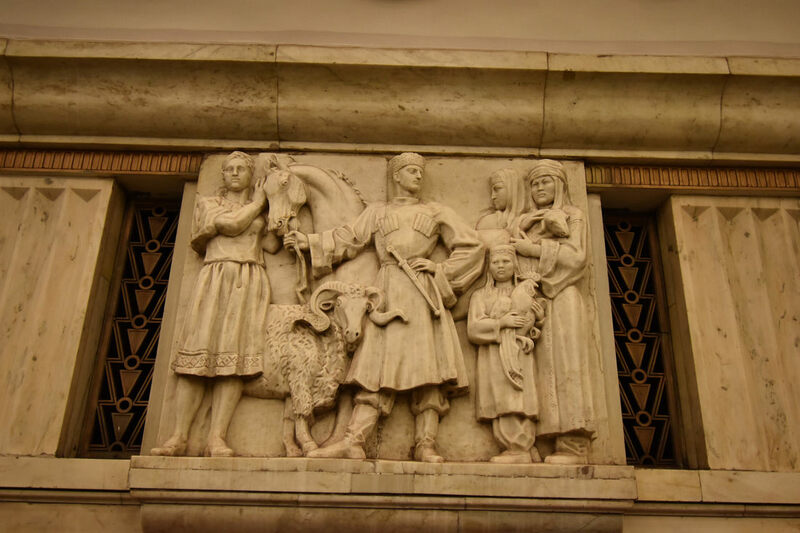 The reliefs that run along the station reflect significant advancements in the development of Soviet Union agriculture. No more beats! 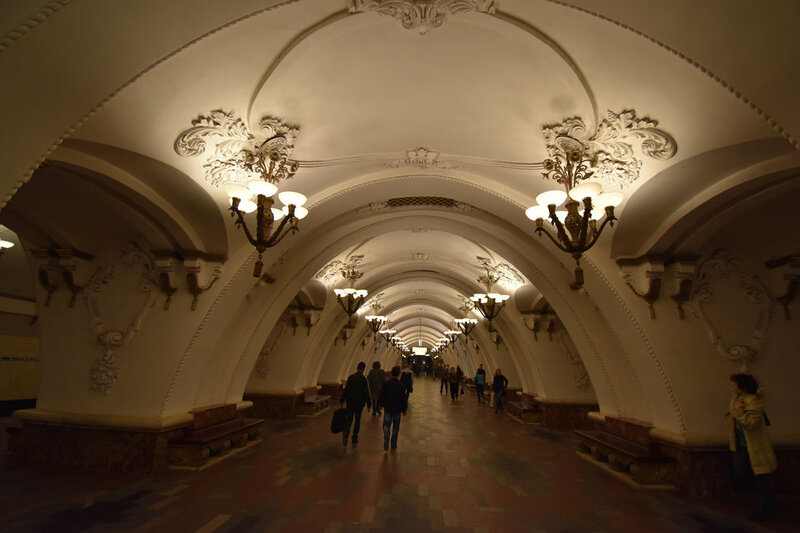 I stayed on the circle line to Komsomolskaya Metro Station. 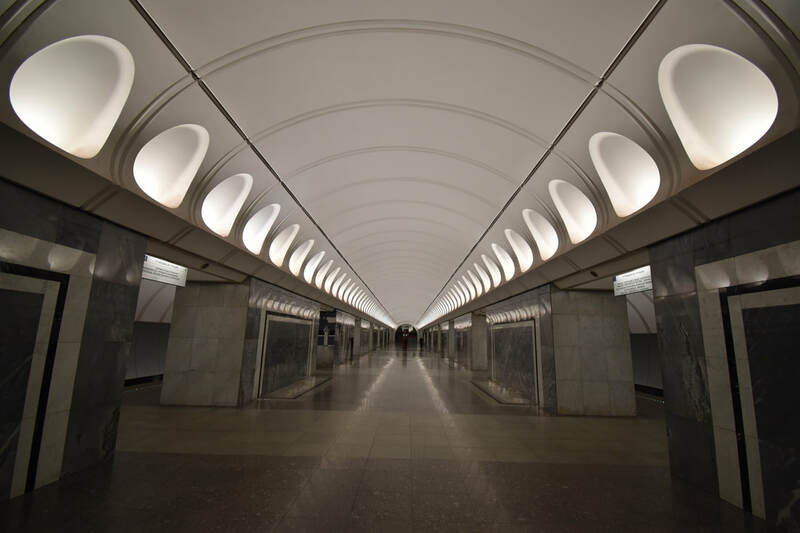 At some point if you are taking a train to St. Petersburg or elsewhere in Russia you will likely pass through this metro station since it is near Moscow's major train stations. 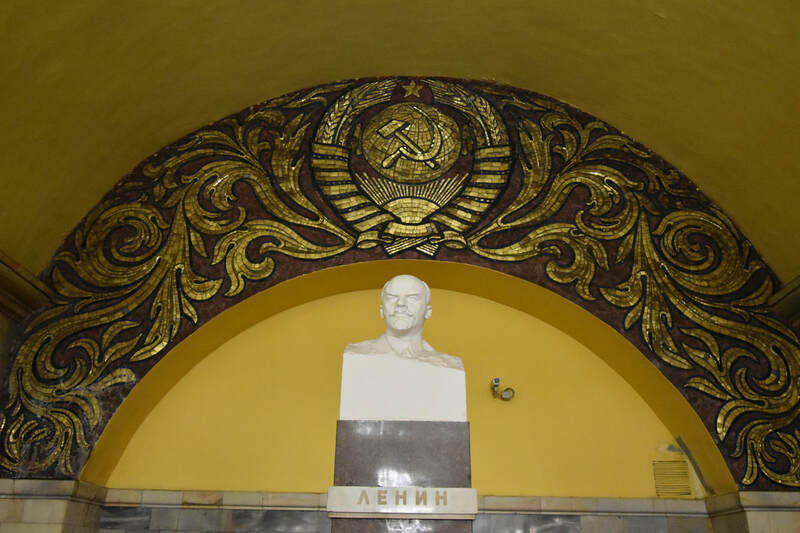 The station was designed as an illustration of a historical speech given by Stalin on November 7, 1941. 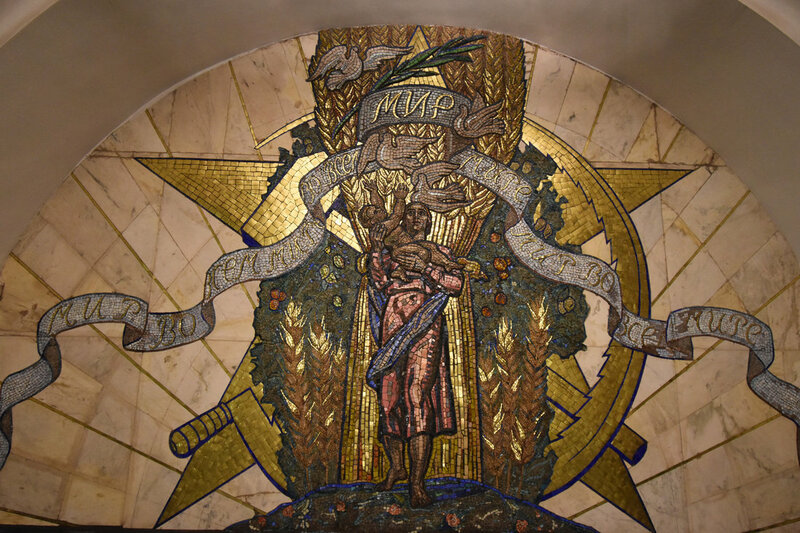 In this speech, Stalin evoked the memories of military leaders of the past, and all these historical figures eventually appeared on the Komsomolskaya's mosaics. Taganskaya is a couple of stops down from Komsomolskaya. 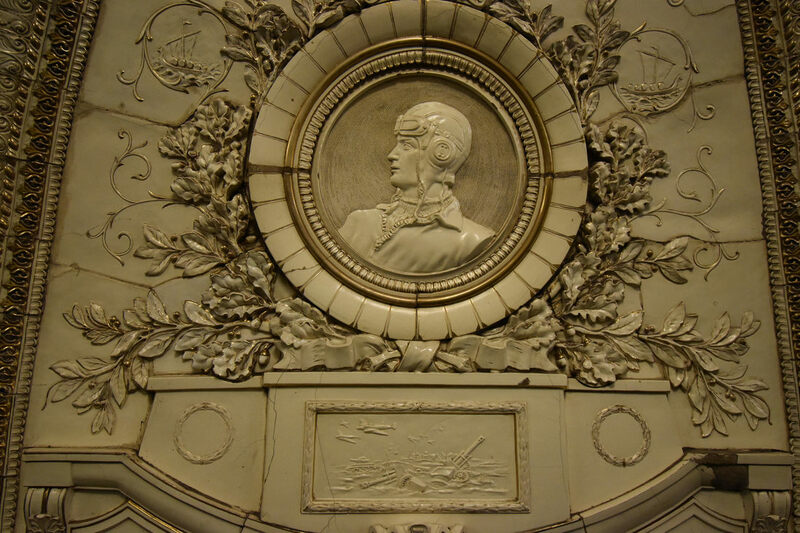 The reliefs have a nice shade of blue for their background and continue the military theme of other stations along the Circle Line. 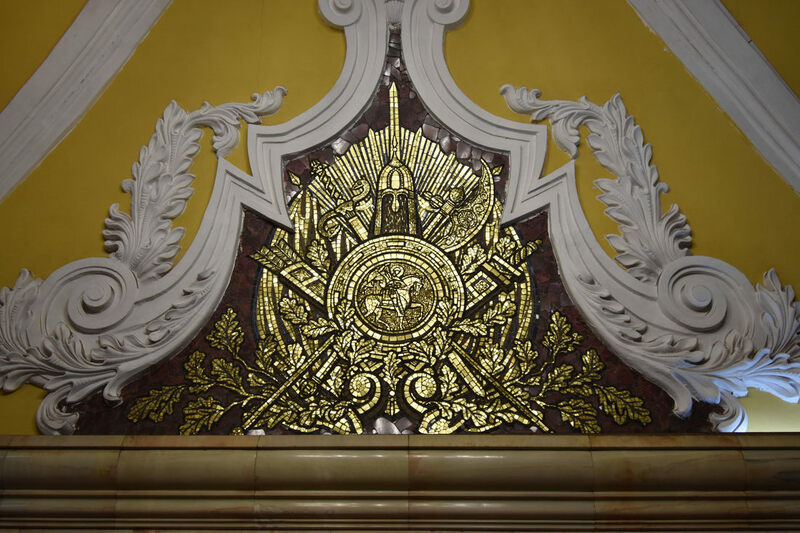 The reliefs honor the Navy, the Army, and the Air Force. I then backtracked to Kurskaya Station to connect with Track 3 - Blue Line. 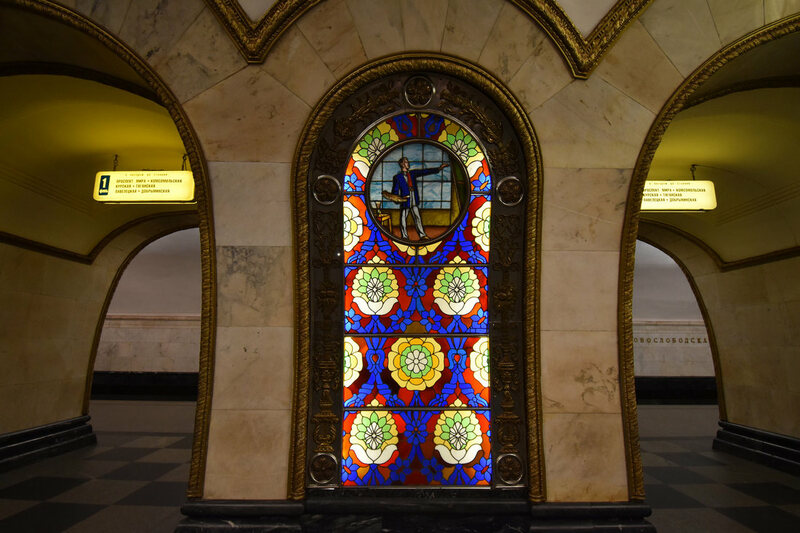 I headed east on the Blue Line to Elektrozavodskaya. The station is near an electric power plant and that is reflected in the design. There are 53 rows of 6 lights, 318 in total. With all those lights it's hard to believe the power plant could supply electricity to the rest of Moscow. 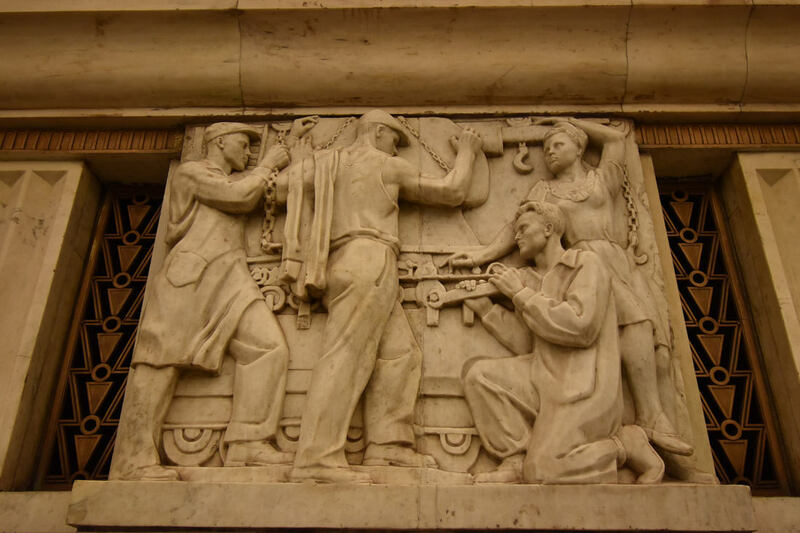 The reliefs incorporated the struggle on the home front during WWII. An interesting note in Soviet Union artwork is that women are typically portrayed as rather strong and stout instead of embracing the female physique. This was done intentionally to show that women contribute to the Soviet society...or at least help in the fields. From Elektrozavodskaya I took Track 3 back to Moscow's city center and the Ploschad Revolyutsii Metro Station. 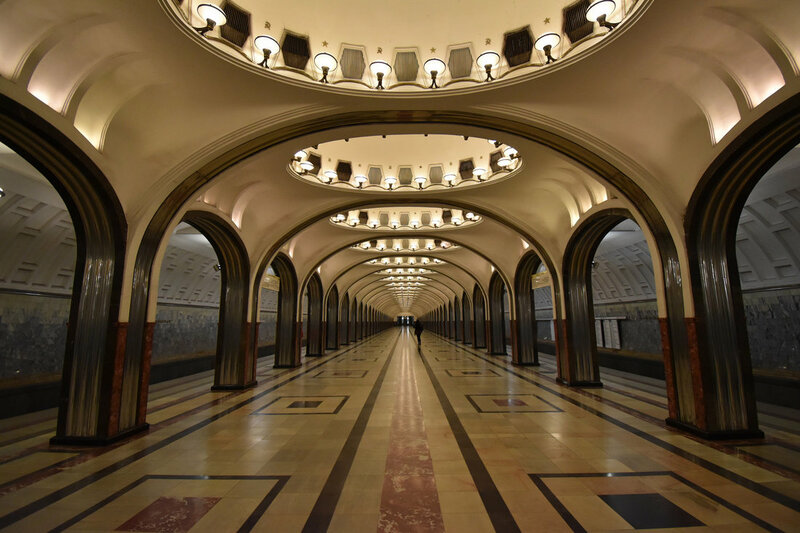 This may be Moscow's most famous metro station and one that everyone passes through at some point during their Moscow visit. 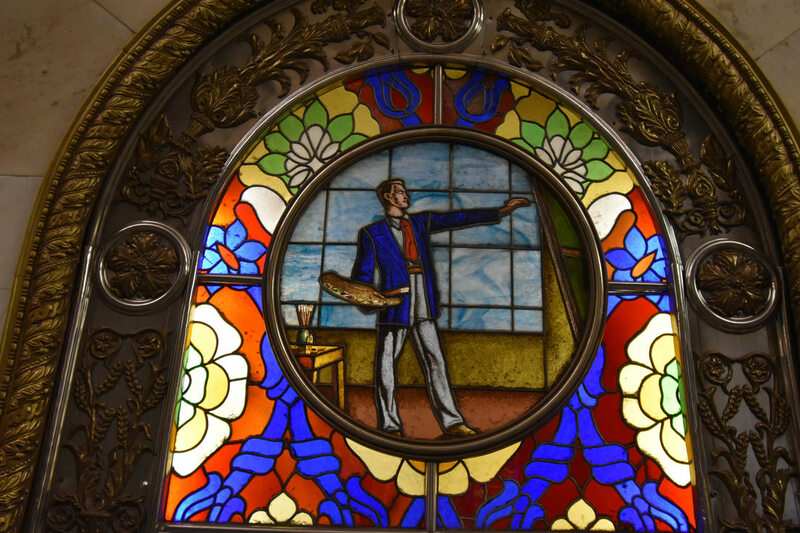 76 life-size statues are built into the platform archways. 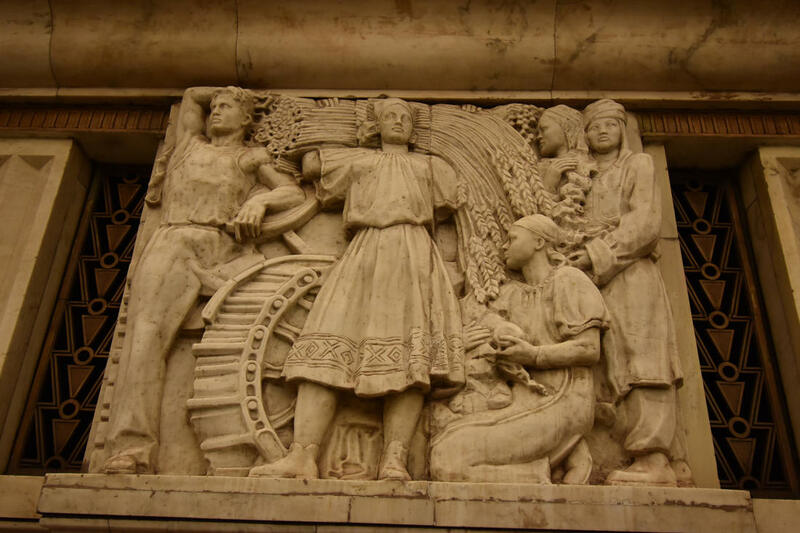 The statues depict soldiers, farmers, athletes, writers, aviators, industrial workers, and schoolchildren. 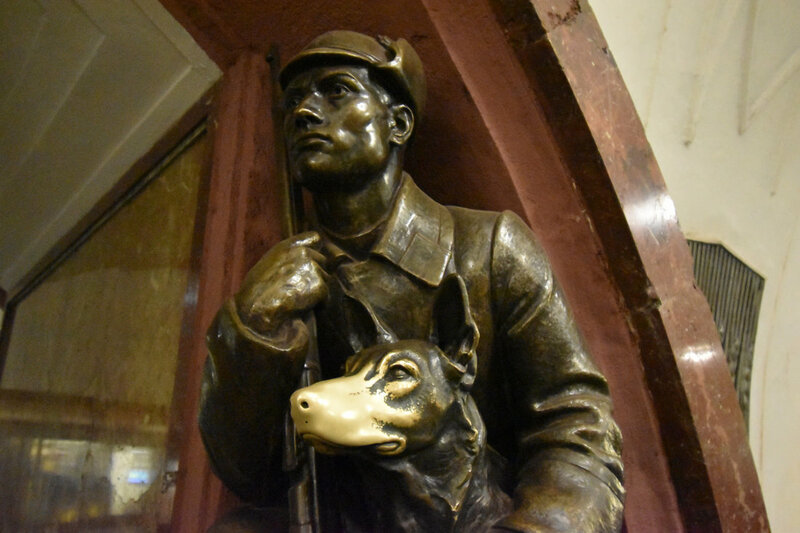 Superstitious Muscovites rub the dog's nose for good luck. 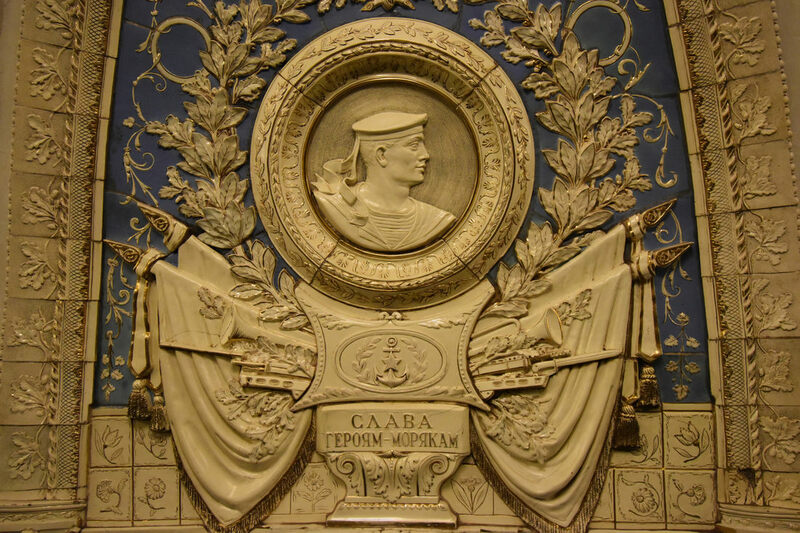 The next stop over is Arbatskaya Station. It's a nice station. 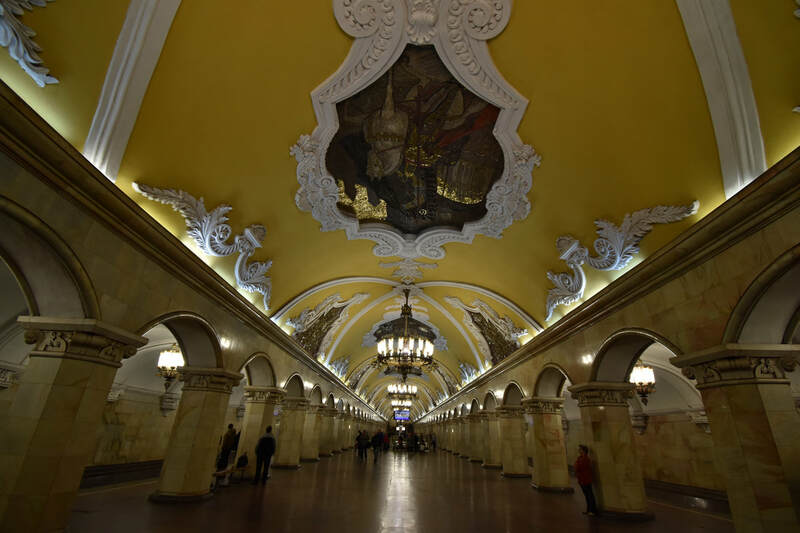 Very elegant like a room in Peterhof or Catherine Palace but lacking the wow factor of Moscow's other stations. 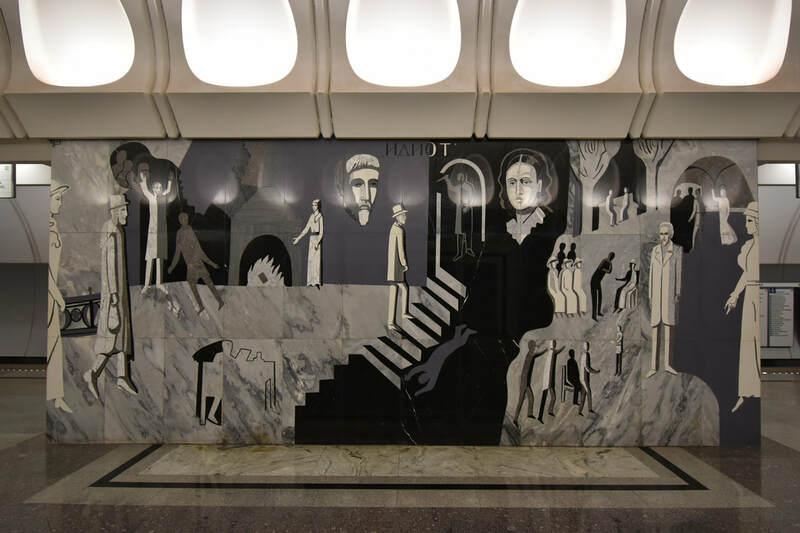 A couple of transfers brought me to Dostoevskaya Metro Station, one of Moscow's newer stations that opened for service in 2010. Only one blog mentioned this station. 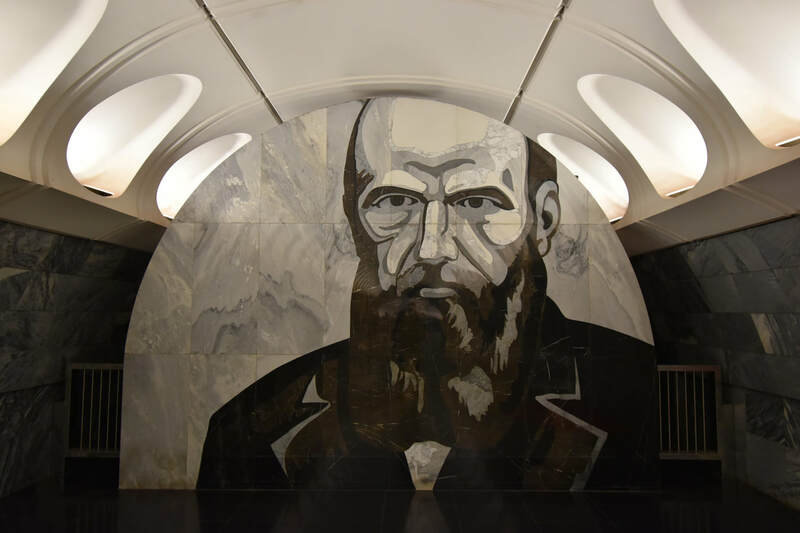 It's worth checking out because it's dedicated to Fyodor Dostoevsky. A smiling photo of the author is up the stairs heading towards the exit. 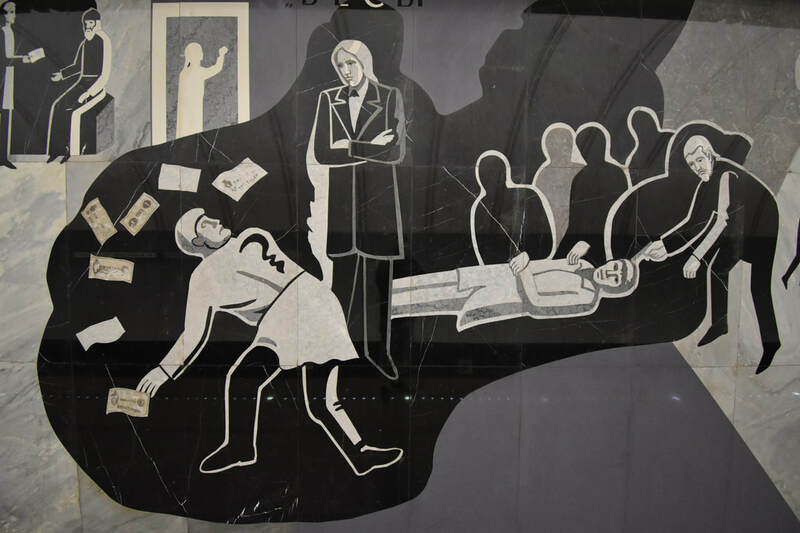 The designers of the station didn't play it safe with the imagery - of the various scenes from Dostoevsky's books two that were included show a suicide and a murder. Not sure I feel more inclined or less inclined to read Crime and Punishment after visiting this station. 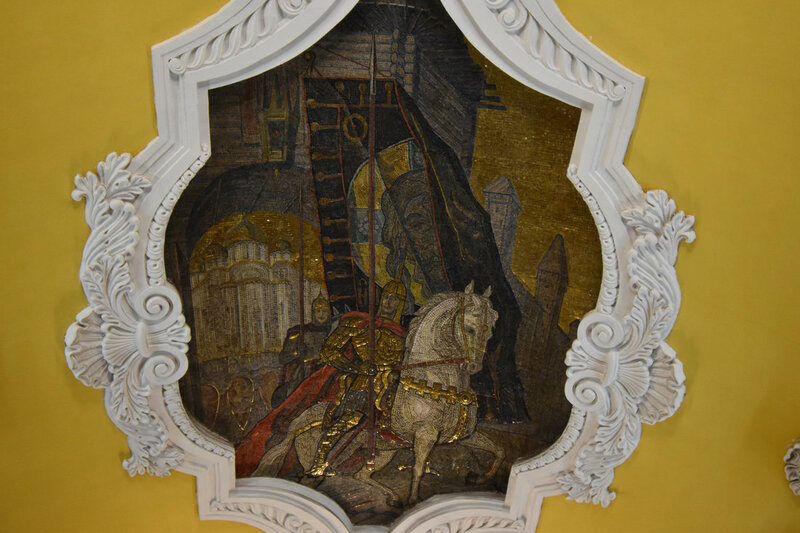 I visited ten stations in an hour and got to see a different side of Russian art...all for under $1.